A historic summit of Sullys took place on TODAY Thursday when George H.W. Bush's service dog, Sully, met the hero he was named after, pilot Chesley "Sully" Sullenberger, and even shook his hand. "It's quite an honor," Sullenberger said of meeting his namesake. The canine Sully touched hearts as the beloved companion of the 41st president before Bush's death at 94 in November. Sullenberger, 68, is a retired airline captain who saved 155 people aboard US Airways Flight 1549 in 2009 when he safely landed the crippled plane in New York City's Hudson River. The dog became such a beloved part of Bush's life that he even had socks with Sully's face on them. The canine also helped comfort Bush in the aftermath of the death of former first lady Barbara Bush at 92 in April. "I think we sometimes don't think of service dogs as helping those that are in their final months, but the comfort that this dog provided my whole family..." TODAY's Jenna Bush Hager said on Thursday. 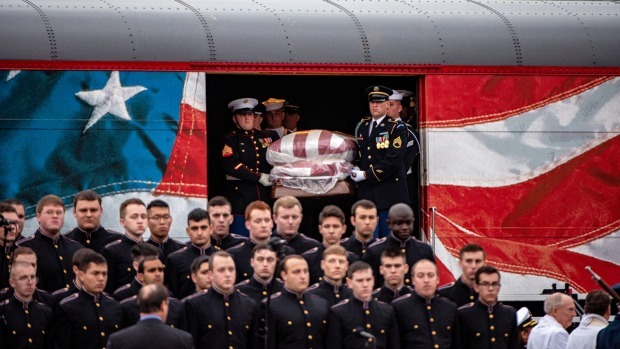 The dog faithfully served to the end, which was captured in a touching photo of Sully in front of Bush's casket. "What a vigil he was holding," Sullenberger said. "It was quite a moving image. That was the iconic image for me of the whole service." President George H.W. 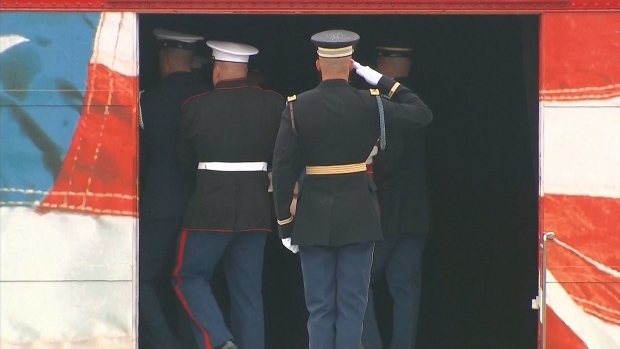 Bush was buried Thursday in a private ceremony in College Station, Texas, after three days of remembrances in Texas and in Washington, D.C.
Sully bonded with the whole Bush family, who called him "Sully H.W. Bush." He was particularly adored by Jenna's daughters, Mila, 5, and Poppy, 3, who made a special appearance on TODAY to give their good buddy a hug before he embarks on his new mission. Sully will be joining the Walter Reed National Military Medical Center's Facility Dog Program starting next week, where he will work with wounded veterans. "It was very important to President Bush that Sully carry on serving veterans, so he chose that Sully wouldn't work for one individual person, but that he would serve many veterans, and the hospital setting is the perfect environment for that," Sully's trainer, Valerie Cramer, said on TODAY. Dogs have also been an important part of Sullenberger's life. His family has been training guide dogs for the blind for more than 20 years, and his oldest daughter is now in school to become a veterinarian after raising guide dog puppies. "It's dear to our heart," Sullenberger said. He can also take pride in the fact that the other Sully will continue their custom of helping others in need. "I think he's going to uphold the tradition quite well I can see," he said.